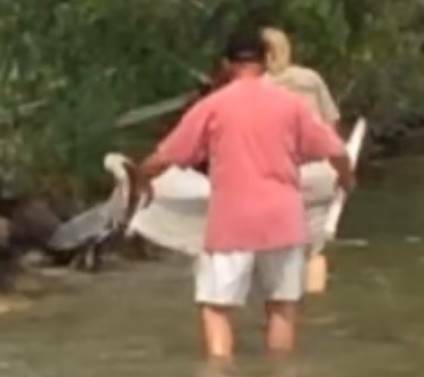 A Great Blue Heron was found entangled with fishing line over the July 4th weekend. Because the DNR office was closed for the holiday weekend, John and Joyce Hansell along with Dave Anderson got a telephone number from the boat inspector at the south entrance for a DNR officer who soon came to the rescue. 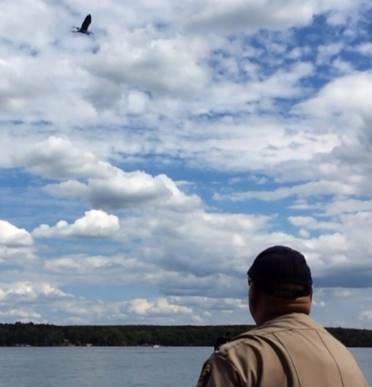 Dave Anderson, Fritz Viner, and two DNR officers were able to capture the bird and safely remove the fishing line. The bird was released and it seemed very grateful as it circled several times before flying away. As a follow up, both the DNR and the sheriff's office were contacted and the best thing to do if you need wildlife or other assistance is to call the sheriff's office (24/7) at 218-732-3331. The sheriff will then call the appropriate number to get a rapid response.